Operators: Golubchikov A., Lebedev O. The film about the Championship of Europe in underwater sport, which took place in the Crimea. Crimea. City Alushta. Participants pass the European championship in underwater sports. Athletes from seven countries - men and women - participate in various types of competitions: swim 1000 meters underwater orienteering, scuba diving at 40 meters. Competition in the open sea and the pool. Judges at work. Spectators in the stands. Presentation of prizes to the winners. The flags of the participating countries of the Second European Championship of Underwater Sports by the sea - LS. State and sport flags of the Soviet Union - MS. Parade of competitors - LS. Athletes are Hungary, Bulgaria, East Germany, Spain, Poland, France, the Soviet Union national team - CU. Spectators on the shore - LS. Men are preparing to swim the distance of 1000 meters - MS. Athletes swim under water (Snorkel) - LS., MS.
Water comes out of the champion of the USSR Boris Popov, congratulating his comrades - MS., CU. Start and swim with fins and masks and women - LS. Swimming underwater, world record finish Valentina Kuznetsova - MS., LS. Athletes getting ready, start, swim under water - MS. Athletes and fans with binoculars - MS.
Two men in a boat on the waves - MS.
Imanda campus finishes, out of the water, is on the shore - LS., CU. Starts Boris Popov - MS.
B. Popov under water and on shore - MS.
Spectators on shore applauded Boris Popov - CU. Valentina Kuznetsova talks to judge on the shore. Judges, PNRM. the sea, the waves - MS., LS. The boat with the athletes at the shore on the waves - MS. The team of three divers swimming under water, is on the ground cargo, cargo lifts and floats to the finish line - MS., CU. Awarding of prizes and medals to the winners. Gold Medal Champion - CU. 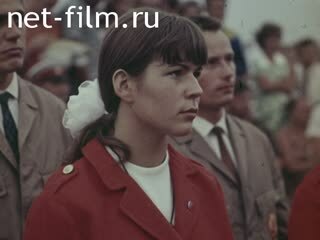 Awarded the USSR national team - MS.
GDR athletes award (2nd place) and France (3rd place) - MS. They stand in the ranks of the Soviet team athletes - CU., PNRM. Finish the leader of the Soviet team, world record holder Sergei Tarasov and athlete from France John Ten-Uedt in water - MS.
Starts, under the water, finishing European champion Svetlana Menshikov - MS. In between the competition, participants relax on the outdoor terrace - LS., CU. Lie mask for snorkeling - MS.
Athlete from Spain, wearing a suit diver - CU. Ammunition submariners - LS., MS., CU. Athletes submariners Dress - MS. Athletes on the bank measure the distance under water - MS., CU. Animation: run submariner - MS.
Buoys, show the movement of athletes. Athletes on the shore - MS.
Bui I. Campus - CU. Athletes in the boat - MS.
Campus finishes, out of the water goes - CU., LS. Starts B. Popov - MS.
Starts B. Popov, buoy Popov Popov under water - MS.
B. Popov after the finish - MS.
Women at the finish - SSR. Woman talking to a judge - MS.
PNRM. with athletes on par with the performance - MS. Judges, PNRM. Sea - MS. Athletes under water - MS. Awarding of the Soviet team - MS. The second place team receives the GDR - MS.
Third Place - Team France - MS. The Soviets - CU., PNRM.